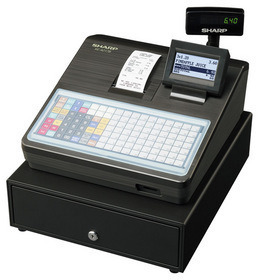 Large, easy-to-view multi-line LCD operator display with tilt mechanism. Built-in SD Card slot for easy sales data transfer to a PC and programme backup. Guided programming for easy set-up and Help key for operating instructions. Electronic Journal stores transaction data in memory to save paper. Quick Thermal Printer with Graphic Logo Printing. 99 departments and up to 2,000 articles each with 16-character text. 5 bill & 8 coin compartments.